Brussel sprouts, artichokes, apples, cranberries all were added to various floats today. The creative use of various organic material is amazing. 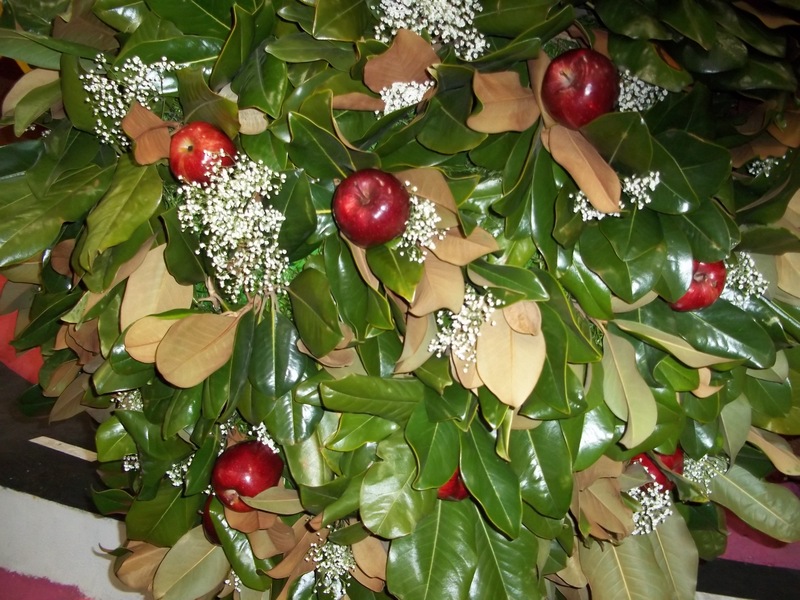 We knew there would be flowers, but sometimes you don’t think about what else is going to be used and how it is placed. The elephant in the City of Glendale float is pretty incredible. We watched as they encircled his collar with cranberries, green ferns are strung between he and the circus cart he is pulling to represent ropes, the wheels are covered with pin wheel carnations on the spokes. At the Farmers Insurance float they have depicted all kinds of bad things that can happen, there is lightening and tornados, all the things that can throw you off your chosen path. It’s funny to me how the float builders create things that happen in nature. The number of real trees represented on the various floats is astounding, yet none of them are real trees. All of them are compositions of other materials so that they look like real trees. Can’t someone cheat and just bring in a real tree sometime? The float that is really outdoing themselves is the LA County Natural History Museum. The crew chief is a bit overwhelmed, but the subject matter is incredible. 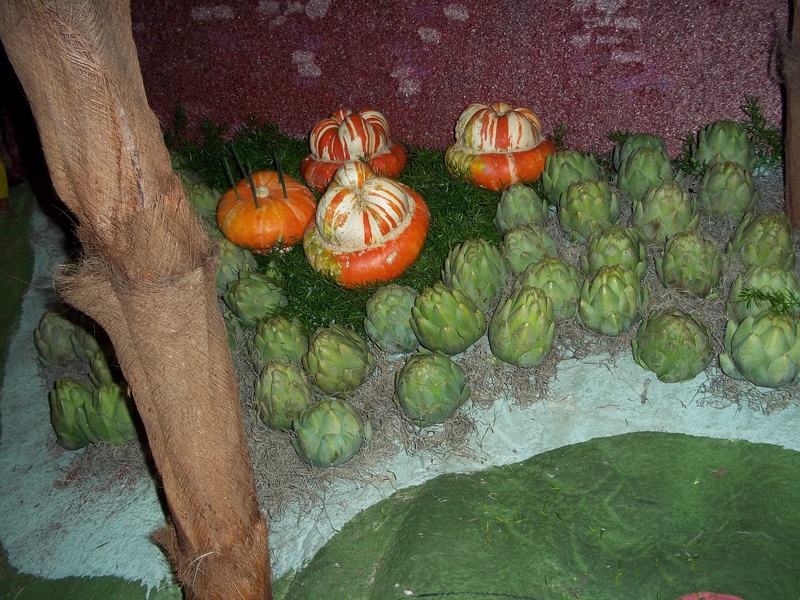 Today when they added the artichokes and pumpkins to create a prehistoric garden, I believed I was there. The décor on the dinosaurs themselves is pretty incredible, brussel sprouts and seeds are creating some very life like reptiles, this one is sure to be a crowd pleaser. The first round of judging begins early tomorrow morning, so all floats were in full swing tonight, the fresh flowers have yet to come out because of the high temperatures here. It’s just too warm to start on them, but fortunately the parade isn’t until Monday. There are still two full days to work on floats if necessary, although the plan is to start on fresh flowers in the morning, I say, Bring ‘em on, we’re ready! This entry was posted in Uncategorized and tagged City of Glendale, Farmers Insurance, Rose Parade, Tournament of Roses by Vagabond63. Bookmark the permalink. I am enjoying the preparade information that you are sending out. I will try to be up at 8am on Monday morning to catch all the wonderful floats. Continue to enjoy yourself.